Jennifer holds a degree in microbiology and worked in the field of molecular infectious disease diagnostics before starting her family. She started looking more thoroughly into vaccine health impacts/injury recovery options and “alternative” health choices after her son reacted violently to his baby shots. She is now a classically trained homeopath and passionate citizen advocate for informed consent and health choice. 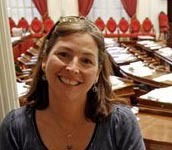 She co-directs the Vermont Coalition for Vaccine Choice/Voices for Choice with Dorian Yates and serves as volunteer VT Director of Advocacy for the National Vaccine Information Center.